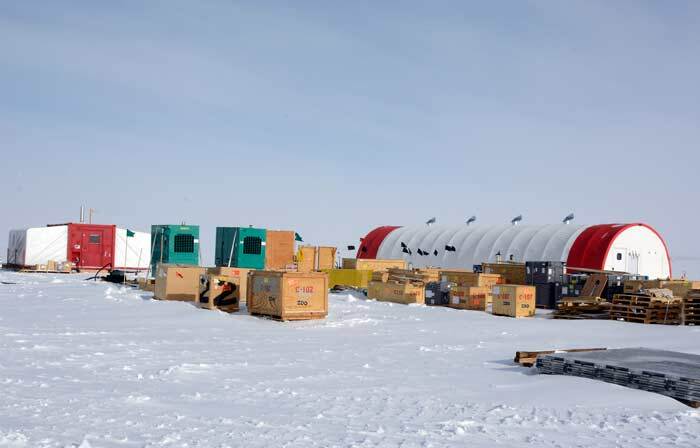 A 22 January 2015 photo of the SPICE drill site, newly constructed in November/December 2014 (PR/APL). The two-year project is a multi-institutional effort--the consortium includes UC-I (Eric Saltzman and Murat Aydin, PI's). Other participants are from UNH, and UW. The project uses an "intermediate-depth drill" developed by IDDO...(more information about the drill). 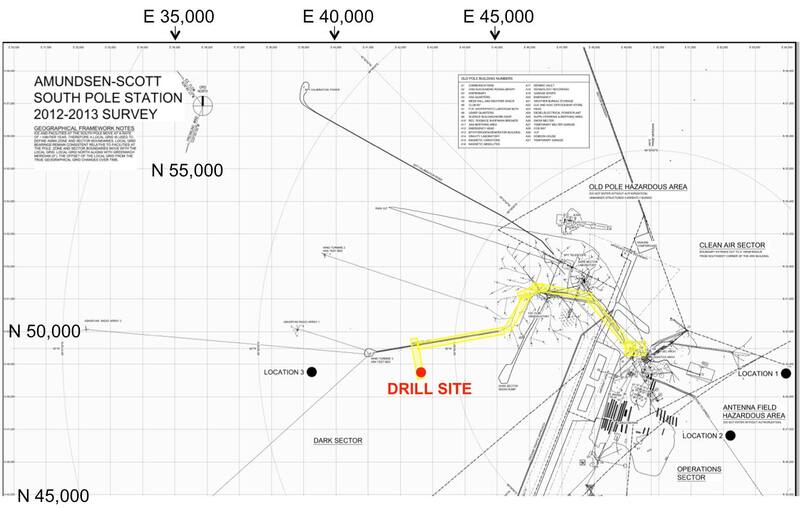 The map location of the drill site, about 1/2 mile west of the IceCube lab (SC). 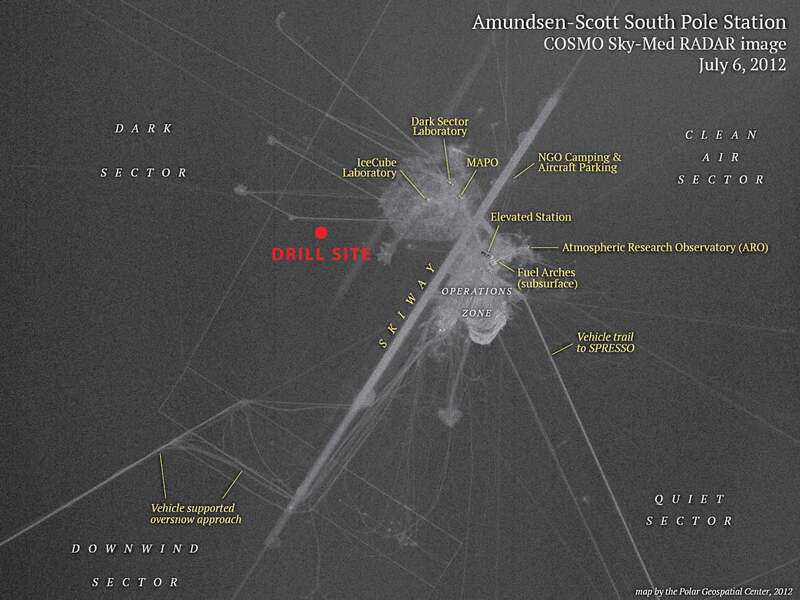 A radar image showing the drill site location (SC). The first members of the drilling team reached Pole on 8 November...they worked to dig out modules that would be used at the site, and prioritized cargo delivery. 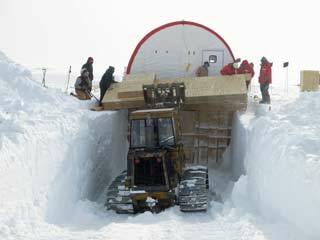 The science team started to arrive a week later. 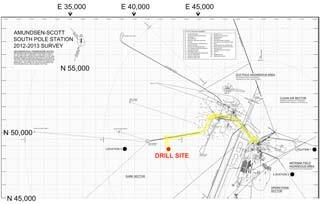 By the end of November, final engineering approvals were given for the drill site facilities, and erection proceeded apace. The newly erected Weatherport, moved over the drill trench (MA). 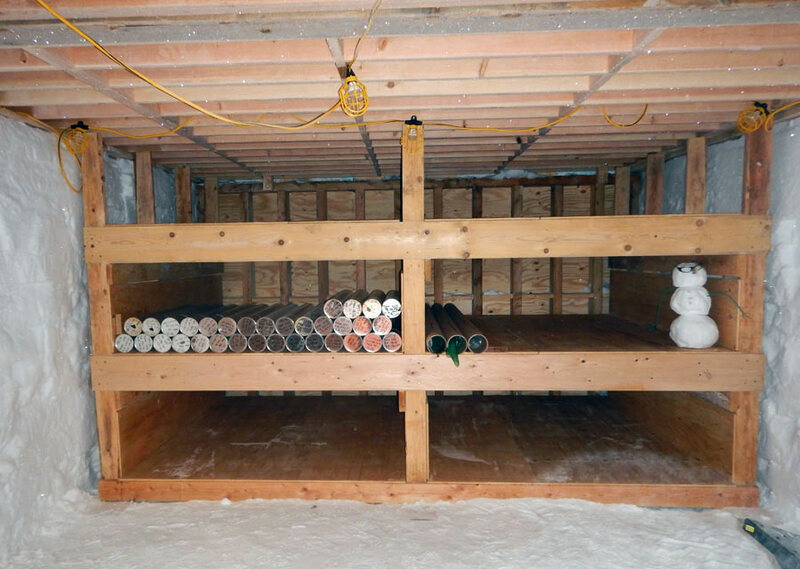 Construction of the ice core storage trench...which is on the other end of the Weatherport from the photo at the top of this page (MA). Layout of the interior of the Weatherport. 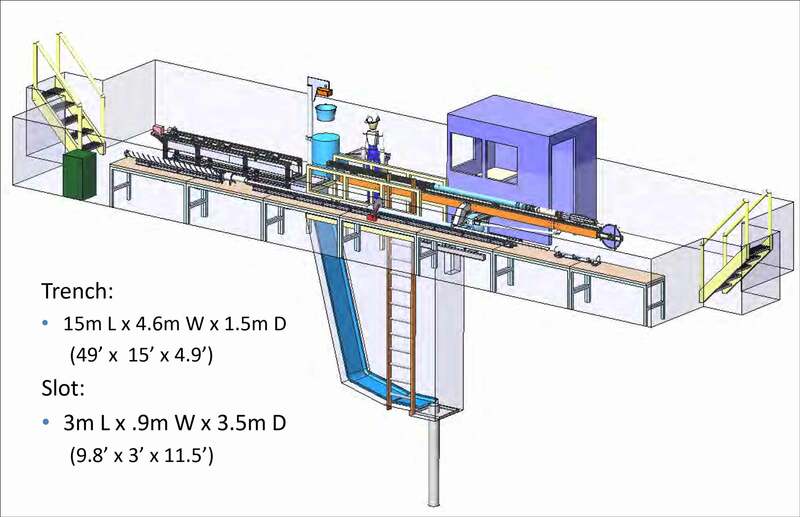 The drill itself has a tilting support structure, which allows it to be tilted into the vertical position, down into the drilling trench seen in the above diagram, for the actual drilling operations. 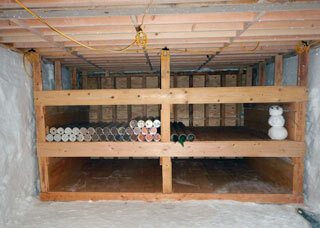 After bringing up a core, it can be tilted into the horizontal position for core removal and processing. 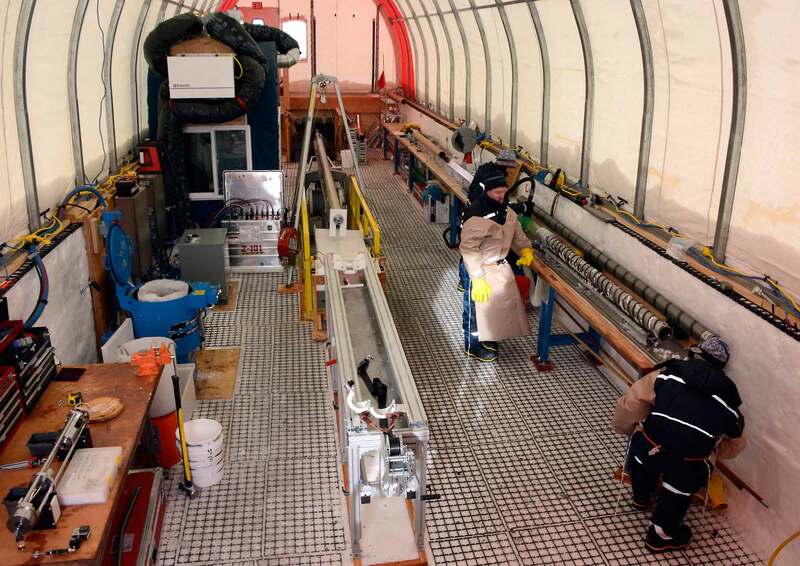 Drilling preparations, tweaking of the storage trench design, and shallow hand auger core collection continued through 7 December...and actual drilling began on Monday 8 December...shortly afterward the main control console was fried. Dealing with that took until Friday when a workaround was developed. Difficulties continued into the following week, when (after recovering 160m of core) it was decided to end dry drilling and start using the Estisol drilling fluid. A closeup of the business end of the drill, just above the top of the borehole (MA). 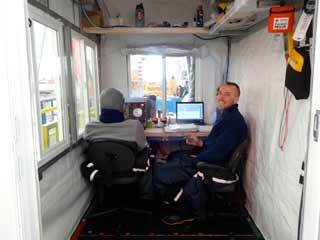 Inside the (somewhat) heated control room...here are IDDO drillers Josh Goetz and Grant Boeckmann (MM). Inside the drilling tent, 22 January 2015. 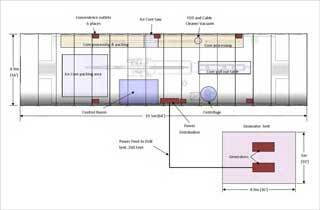 The control room is behind the sliding windows at left (PR/APL). 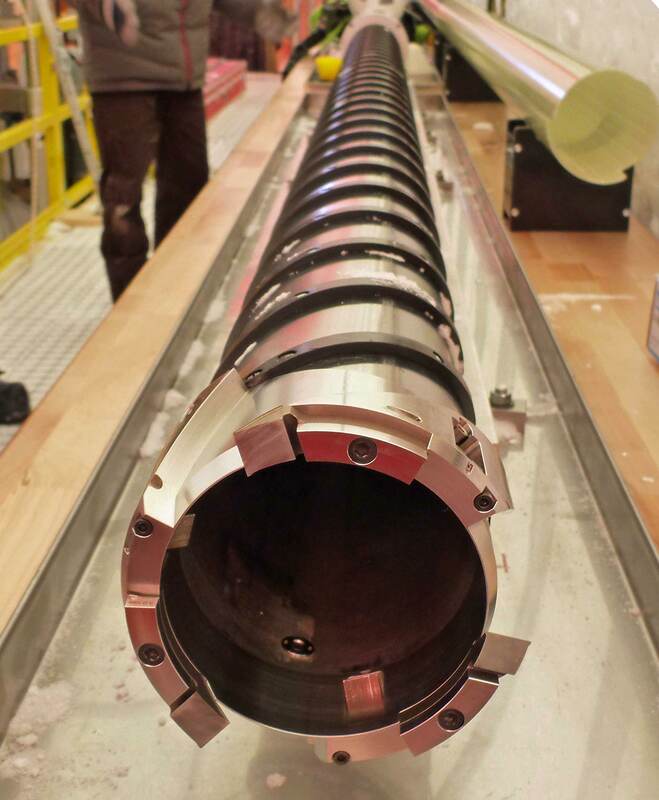 Mindy Nicewonger dealing with one of the cores (30 December 2014)...these got cut up into 2m segments for shipping north (MA). 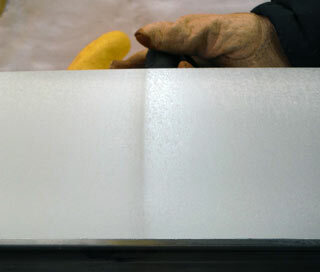 The exposed cutting head and core barrel, with some very sharp edges. Different barrels/heads were used for drilling with or without drilling fluid. 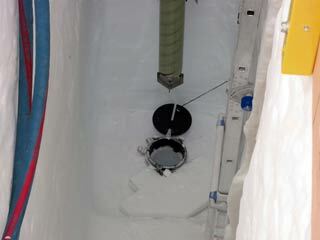 The green cylinder at right is the fiberglass epoxy wound cover tube visible in other photos (JG). At the beginning of January, this visible ash layer was discovered at a depth of 306.5m... from a volcanic event 3,200 years ago in the South Sandwich Islands off of the Antarctic Peninsula (MN). 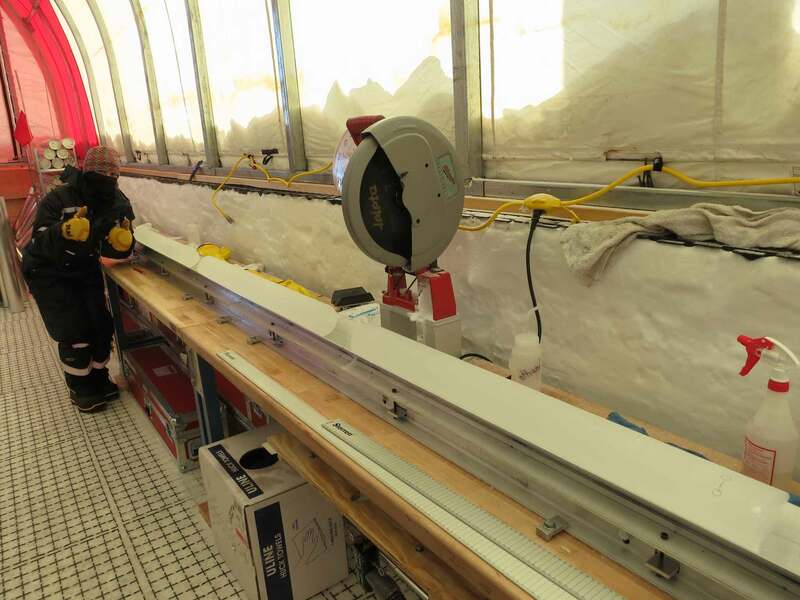 Ice cores in the storage trench. They were left here for a time to allow internal stresses to relieve before shipping north. A number of cores were left here over the 2015 winter (16 January 2015 photo by TF). 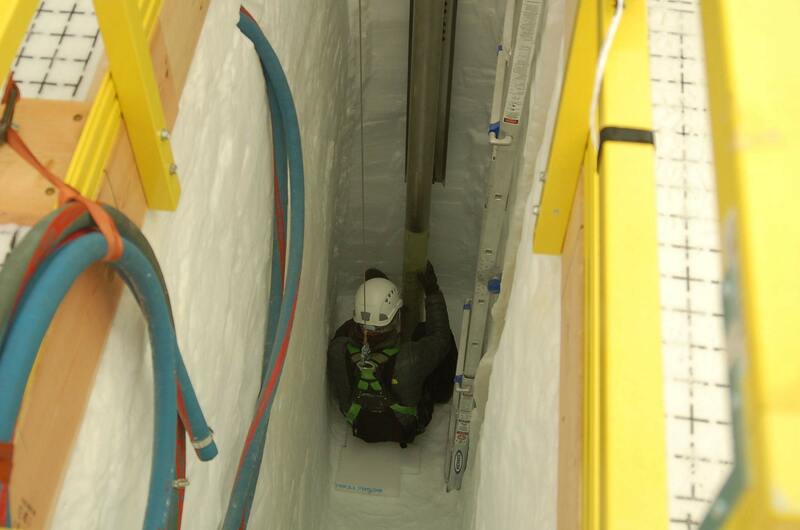 The drilling season concluded on the morning of Saturday 24 January 2015, at a depth of 736m/2,415 feet. Many ice cores were shipped north, with 150m or cores left in the storage trench for the winter. The last remaining members of the team departed Pole on 30 January. 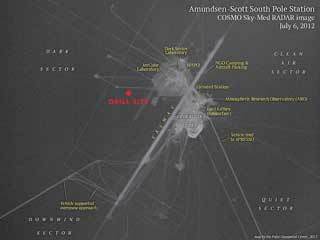 Credits...SC--the map and radar images are from this "about" page from the main South Pole Ice Core website. 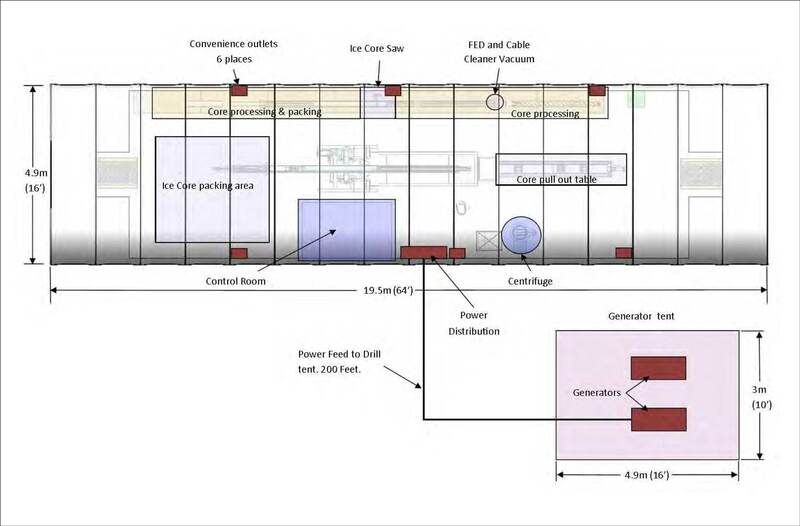 The drill tent and trench layouts are from this PDF report "IDD System Engineering Design Review". Peter Rejcek's photos are all in the Antarctic Photo Library at the indicated links. 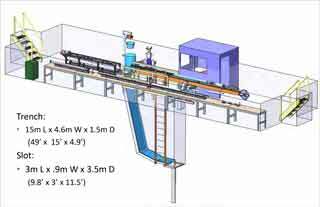 Photos by members of the project team--T.J. Fudge (TF), Mirat Aydin (MA), and Mindy Nicewonger (MN) are from the project's photo site (used by permission)-- this site includes many more project photos of interest. Other Polies with photos used here--Maddy McKenna (MM), and Jase Grimm (JG). 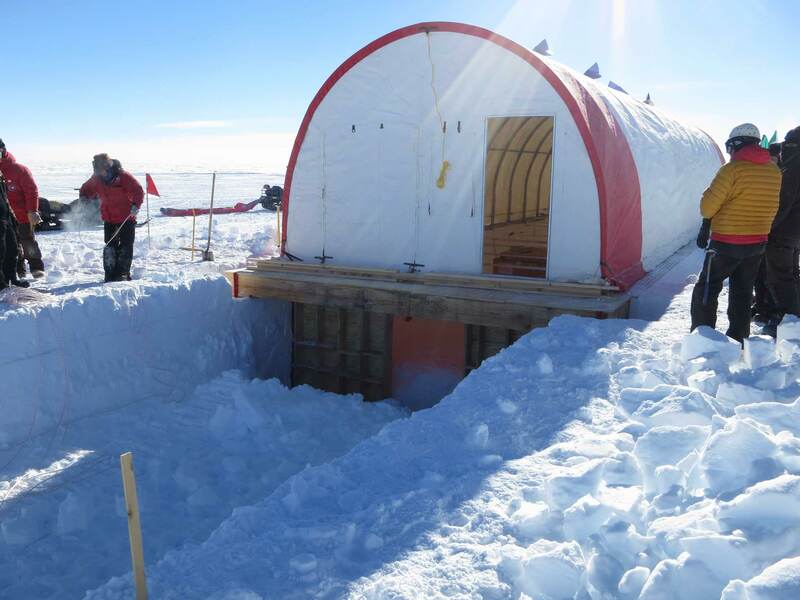 Other good links: this grist.org article describing the project and discussing fudge recipes with postdoc T.J. Fudge...and this 26 March 2015 Antarctic Sun article about the project. Closer to the station, but still in the dark sector, the remains of the VIPER telescope structure were removed.